No More Icky Shower Curtains! Check out the Sterling Prevail shower door. Do you get grossed out by shower curtains like I do? Don’t people (even hotels) know you can wash them so they don’t have that moldy smell? And then that curtain touches you….ewwww. Just get rid of those shower curtains! Please!! I don’t do shower curtains! Hate them. A few years ago, we installed a shower door on our tub and it was one of the smarter things we did! But, our doors were not nearly as brilliant as what is out there now. I’ve been looking at the new Sterling Prevail shower door. What makes it different is a flexible track. It’s easy to clean, comfortable and looks great in any bathing/showering spot. Sterling calls this track ComforTrack. I love this. The track bends so you can sit on it. It’s still easy and comfortable to supervise the kids, but, with these doors, they would also contain much of the splashing water. Don’t know about you, but, I got really tired of drying my whole bathroom every single bath time! You can contain the kids and the splashing! Woohoo! You don’t have to dry the bathroom…..again! 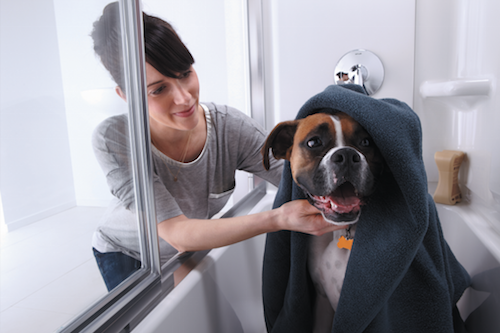 Another great idea is to bathe your four-legged family member in the tub with the Sterling shower door. Anything that controls the water all over the bathrooms is awesome! Take a look! I think you’ll like it! The ComforTrack is a brilliant idea and a great upgrade from the old shower doors! 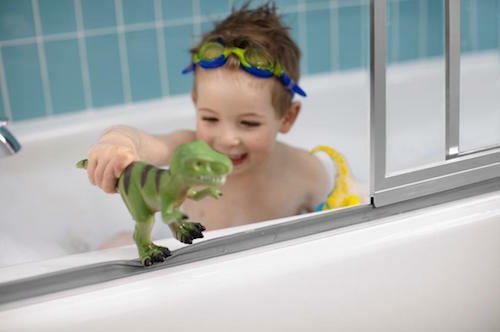 Do you have any practical tips to make bath time less messy? Please share! What a great idea! My bathtub is alwasy used as a play tub. Water goes all over the floor! I will be checking into these doors – ASAP! Thanks for sharing.